FASHION TRICK ! 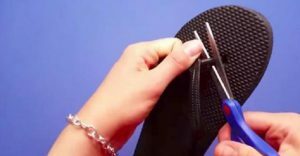 Here is an awesome idea that will transform your flip flop sandals and it will almost cost you nothing. In this video, we propose you different models that you can remake at home and one of them will surely inspire you. Start with getting a pair of flip flop sandals, you can use old ones if you want. With cissors, cut part that goes between your big toe and the second. You’ll be left with the sole. Take some rope and make a loop and then make a knot. Cut the loop starting form the knot and repeat this step 6 times. Insert each loop in the holes that are in the sole. Take another rope, pass it in the 3 loops and tie it around your ankle. If you prefer, you can use some ribbon or leather for the necklaces on which you’ll put artisanal pearls.